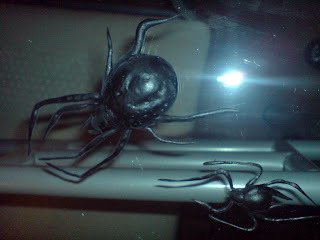 I´ve always dreamed of brooched spiders! 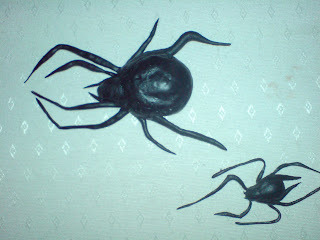 I´ve tried to made some with fimo, it´s easier to use than what it seams (it´s like working with plasticine......) Here are the results of my first attempt. More will come soon..........with shiny black beads on! I´ve been doing a bit of research through the net and it didn´t come as a surprise to find lots of forums where the typical "gobshit" tells you WHAT is goth, What is not, WHAT you must or must not listen, read, wear, think in order to be CONSIDERED goth. It makes me laugh BUT in a sad way, keeping in mind that this subculture -as any other urban tribe- emphasize its rupture from the mainstream through an individidualistic and extreme attitude with their clothes, music and other physical/artistic manifestations. There are as many different types of Goths or youths "into goth" as gravestones in a cemetery, but that doesn´t mean some are more goths than other ones. The problem is that people tend to classify everyone else who is different from them as "the others" without taking a minute to think who might be into what. Music and specially Fashion, the field this blog is mainly aimed to; have always been the display of someone´s or a specific social group´s ideas. Since de 1950s, when the phenomena of urban tribes started, a part of the society -the young one- has always expressed their feeling of rebellion and alienation through very specific and extreme attitutes and looks. But the question is, what is really Goth? Why are that people dressed in black? In order to understand Goth, it´s necessary to understand what PUNK was really about, because Goth is a derivation of this ephemeral urban movement. Punk was born in the 1970´s of a miserable United Kingdom as a reaction to the stemmed political-economical situation (despite all the economical and social progress of the earlier decade, the country was suffering an alarming increase in unemployment, the lifestyle was getting more expensive and also, there was the crisis of the petrol) and the doomed and more and more commercialized Rock, whose artificial and over the top looks and empty messages, the youngsters didn´t feel identified with. The Punk, rather than being based on making music, it was based on the social denuntiation.